It's upon us again, and this year I'm working with LA Makeup Academy to do the catwalk looks for the models. It means early starts and late ends; three days of being on my feet from about 7 (that's in the am) to about 11 (that one would be pm). It will mean, in essence, coming home, scrabbling around to clean lots of brushes quite late at night, to get them all ready for the following day. It will categorically mean comfy shoes and a cardigan (there will be a lot of outdoor events, and supposed Irish-Indian Summer aside, it just won't be that warm). But I can't wait! There is quite a full programme and all events are available here, at this link. This one (also look here) is the inspiration behind the day-time look. This visual is from the Gucci AW12-13 campaign. How beautiful is this. 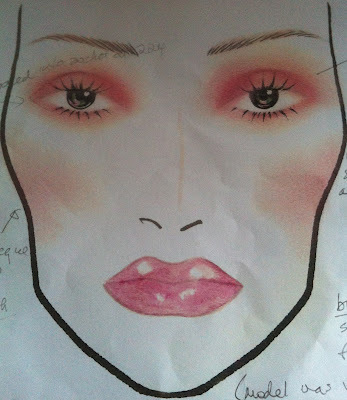 The planned day-time look will change slightly from this visual to include heavier brows. The skin, eyes and lips will be matte/satin finish across the board. This look, to me, is reminiscent of this look here, which was created at a MAC Pro Bridal Masterclass I attended back in March; either coincidentally, or the MAC look was inspired by the Gucci look, or vice versa. Either way, it's a beautiful look and one I'm looking forward to recreating. These are again inspired by Gucci's AW12-13 campaign (for these images, click here). The night-time look will see the addition of a smoked-up (likely bronze) eye, individual flared lashes, keeping the lip but glossing it up, and adding a more defined contour, but little in terms of blush colour or bronzer. Obviously these will be somewhat tweaked, depending on the model's skin type/tone/shade etc, but in essence this is it. LA Makeup Academy are the Makeup Partner for the festival, so most of the products will be their own, for example the LA Creative Lashes (evenings) and the LA Creative Illuminator Stick, together with their own foundation range (I haven't used LA Makeup products before, so I'm looking forward to trying them out). Note that there's a bunch of excellent offers to be found on this page for the duration of DFF'12 - worth a click-see! DFF'12 is taking part from Thursday 06th September (yep, at time of post, that's today!) until Saturday 08th September, at multiple locations around Dublin (check out aforementioned website for more information). The Lookbook for the festival is available here. Find DFF on Twitter (@DublinFashion) and via hashtag #DFF. Dupe Alert: MAC Fashion Fix!